Product prices and availability are accurate as of 2019-04-16 14:27:07 UTC and are subject to change. Any price and availability information displayed on http://www.amazon.com/ at the time of purchase will apply to the purchase of this product. Boxed Set of 125 Richland Tealight Candles. The Tealight Candle is a self-contained, versatile little candle. It's efficient and very inexpensive . The Tealights featured here are compression molded and set in aluminum cups with 100% cotton wicks. Unscented Tealight Candles are a great value and perfect for weddings, restaurants and parties. They can be used in potpourri burners, food warmers or any standard Glass Tealight Holder. Use them every day. Size: 0.5"(H) x 1.5"(W). Burn time 4-5 hours each. 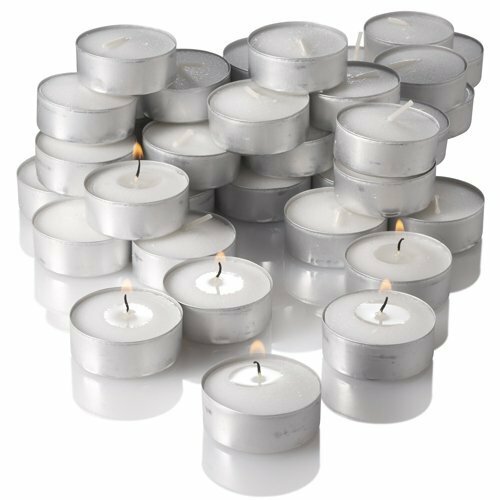 Richland® Tealight Candles Long 4-5 Hour Burn Time Perfect for Weddings & Other Events Fits Perfectly With Eastland® Glass Tealight Holders (Not Included) Highest Quality. Made in the USA.